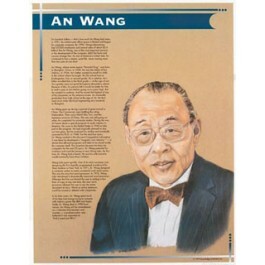 This educational poster features an original illustration of businessman and inventor An Wang, as well as biographical text. 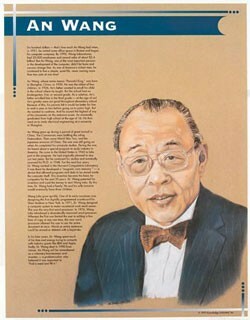 An Wang was born in China in 1920. He came to the U.S. in 1945 to study in America. After receiving his Ph.D. he worked at Harvard where he developed a device that allowed programs and data to be stored inside the computer itself. His invention allowed him to start Wang Labs, which grew into a multibillion dollar company. Dr. Wang also developed a dramatically improved word processor, that changed computing forever. This poster is a great way to introduce students to one of the greatest visionaries of the 20th century, whose work has impacted the lives of everyone who uses a computer.